Full power to weapons and engines! Lets bring it on! One with action? I haven't watched much of that genre, or any new series at all in a while, so probably I can't provide much help. Maybe Canaan if you haven't seen it yet. The manga is YMMV, but it was enjoyable enough for me. The plural of "Anime" is "Anime". Not "Animes." Moving on, uuuh, have you tried "Elfen Lied"? (Though the action can get gory and creepy pretty quick. Simply at the BEGINNING!) Anyways, um, alternatively, you can try the really, really old anime series, "Gatchaman", and you can try "Casshan" and other Tatsunoko anime (Tatsunoko is known for action, transformation, and a bit of humor.) "Karas" is pretty actiony, though disturbing and gory too. "Strike Witches" barely counts as action, but lacks plot substance in a few ways. "Vampire Knight" is romance, though there's action and quite a bit of it at times. Not all of these are very "new" anime, but they do have plenty of action. "Kurau: Phantom Memory" has been in existence since 2004, is a completed series, and has a number of moments of action, for the sake of drama. "Noir" is a classic one too, and has many moments of action and can get a little jarring and disturbing in spite of the lack of blood. "El Cazador de la Bruja" is a good one, taking place in Mexico and a few other places in Latin America. Gun-fights and other combat moments, though it's also a drama anime. "Excel Saga" is action packed, if you don't mind the CloudCuckooLand nature of the place, and the fact that it appears to have been written by people who wanted to push the limits of both insanity and how far they could go to have the episodes just borderline stay on TV. 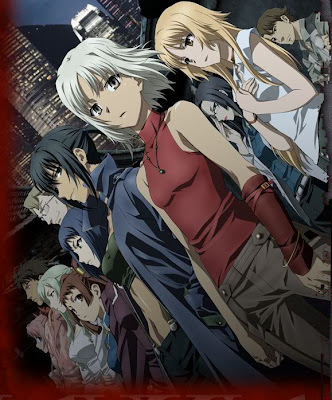 The final episode was deliberately made too intense to be aired on TV, and had to be sold as an OVA. Any Mecha anime you can find is bound to be of the Action genre. Try the Gundam series, etcetera. 'Tis the will of all things good... to annialate all that oppose NanoFate. (Well, liberate them into our fandom only by force).. from the power (or threat of use of) of the RMZ4 space laser, Ragnarok. I don't know why... but everyone's been talking about High School of the dead... but yeah... I haven't watched that one .-. 07-Ghost is good... although comedy is really present at times because of punchlines but still good action. You can get the first three seasons of Slayers for about 50 bucks. One of the best dubs EVER. Oh, and the fight scenes are pretty awesome. I almost forgot to recommend Princess Tutu, this is one of my favorite series of all times. A really great and beautiful anime that everybody should give a chance. There has been some good things out lately. I wonder if you guys have spoiler tags? Ahh well, we'll see won't we? There are probably others I have seen that I don't remember. I spend much more time writing then I do watching anime. Irecommend Valkyria Chronicles. It is quite funny and also full of combat. I started laughing during the 1st episode onwards. When you said action, the first anime that came to mind is Black Lagoon. Though I doubt you haven't seen it yet. Since January 6th, a new anime called Mahou Shoujo Madoka Magica aired.. It's a very refreshing drawingstyle and what's even better, is that it's being directed by no one other then our favourite director, Akiyuki Shinbo!! The same person who directed the Nanoha series >w< And like MSLN the movie, MSMM is being licensed by Aniplex. If you thought that's all, you're wrong! Awesome seiyuu's like Kaori Mizuhashi (Vivio, Yuuno and Sein) and Chiwa Saitō (Subaru, Nove and Quattro) have joined the cast. And last but not least, the music is being arranged by Yuki Kajiura. 14 year-old Madoka Kaname has a dream in which a dark haired girl is struggling against an evil force. As Madoka wakes up and goes to school that morning, the very same girl, Homura Akemi, enrolls in her class. Even stranger, Homura seems to know Madoka and later confronts her in the hallway about whether she cares for her friends or not, saying she should stay how she is or else she risks losing everything. After school, whilst visiting a record store with her friend, Sayaka Miki, Madoka hears a voice calling for help. Following it to an unused storage room, she finds a small creature named Kyubey being attacked by Homura. As Homura insists that she hand Kyubey over, Sayaka helps Madoka and Kyubey escape. They are then caught in a strange illusion and approached by more strange creatures, but are rescued by another girl named Mami Tomoe, who transforms into a magical girl and defeats the creatures, dispelling the illusion. After allowing Homura to escape, Mami heals Kyubey, who wishes to form a contract with Madoka and Sayaka to make them magical girls. I, myself, really loved the first episode ^^ the drawingstyle is pretty odd, which makes it interesting to watch! The storyline is pretty much like a normal magical girl's series so far, but thanks to this unique drawingstyle, totally worth it!